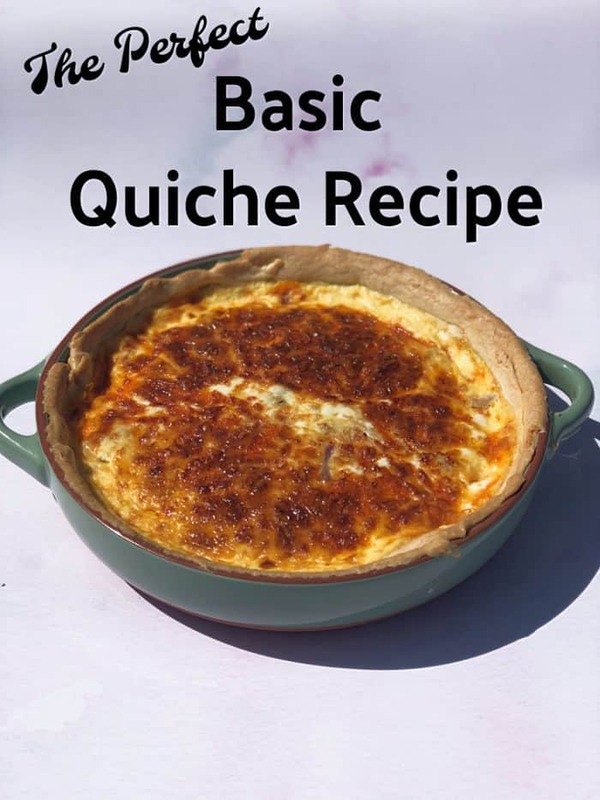 Basic Quiche Recipe – perfect for using up leftovers…. 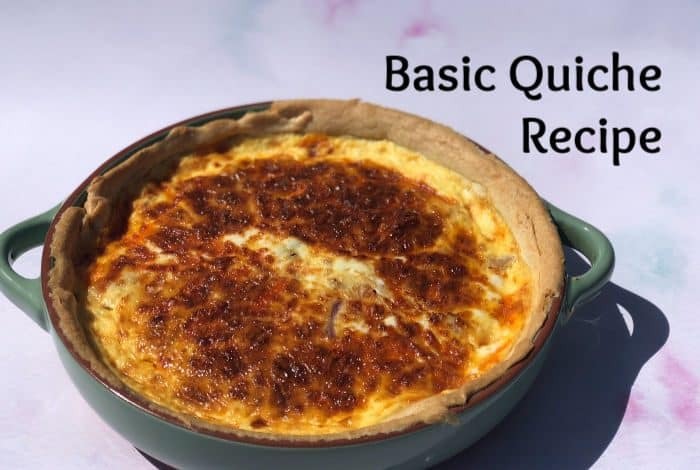 My basic quiche recipe is one that I learned from my Mam way back when I used to look forward to her baking days which would always consist of the same things – quiche, corned beef pie and a random cake recipe that she would choose from her Be-Ro cookbook each time. My basic quiche recipe is an adapted version of my Mam’s, mainly because I don’t make my own pastry. I don’t do the whole homemade pastry thing usually for a couple of reasons – 1) ready made pastry is about a million times easier for me and b) it’s way less mess and c) there are never enough hours in the day for me as it is so if I can find a shortcut that works as well for us then I absolutely will. I do only buy my pastry reduced though as I often find it in the reduced section at Tesco and when it’s there, there’s usually at least 2 or 3 reduced so I buy whatever there is and pop it in the freezer. When I know I’m going to be making a quiche, I just take one out of the freezer the night before and pop it in the fridge to defrost overnight. 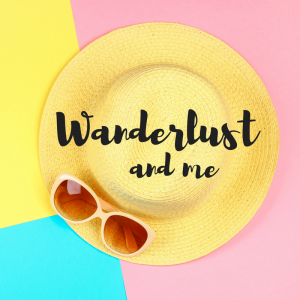 I also don’t fry up a whole pan of bacon cubes to add to it like my Mam used to when I make my own version because I’m not a fan of the saltiness that the bacon adds to the quiche – I prefer to use gammon leftovers in my quiche if I’m going for a quiche lorraine style quiche. 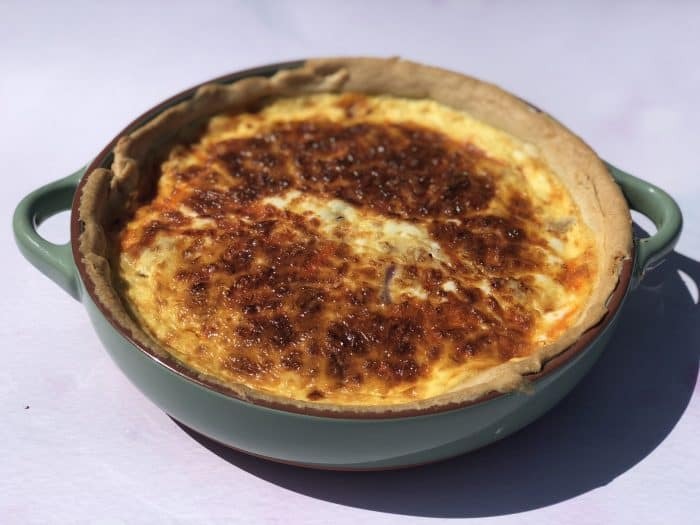 I usually just add whatever I have in the fridge that needs using up so no two quiches are ever the same here – red onions, cold potatoes, leftover broccoli and peas are our favourite additions to the usual cheese and egg mix that form the base of our quiche. So, I guess my basic quiche recipe is actually quite different to my Mam’s after all! 350g pastry – ready made or homemade. 100-150g cheese depending on how cheesy you like it. We like a mix of red Leicester and mature cheddar in ours. Line the dish you’re cooking the quiche in with your pastry and pop it in the fridge for half an hour or so – or even the freezer for twenty minutes. If you’re going to blind bake it then prick the bottom with a fork and pop some baking paper in the bottom of the quiche dish on top of the pastry. Add some baking beans or dried pulses on top and pop in the oven for about twenty minutes. After twenty minutes take it out of the oven and remove the beans and paper. FYI: I don’t always blind bake mine as a very slightly soggy bottom doesn’t really bother me too much so if I’m short on time or can’t be bothered to faff then I just move straight on to the next step. The next stage is to build up your filling and I try to go half to three-quarters of the way up the side of the quiche dish with my filling. The quiche I’ve baked today has a layer of red onion, a layer of leftover gammon, a few leftover sliced potatoes (I’m talking about very few as we had hardly any leftover) and then a mix of red Leicester and mature cheddar grated cheese sprinkled on top. And lastly, you need to beat the eggs and milk together and pour it over the quiche making sure you don’t overfill it as it will expand slightly and if you pour in enough to go right to the top then you could have a mess to clear up! 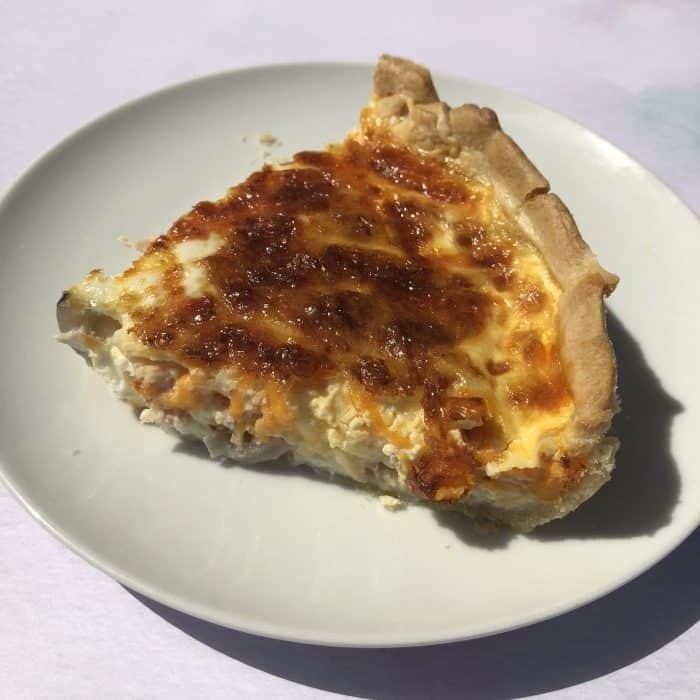 I use a large quiche dish so I go with a six-egg mix – you might need a little less but do remember to reduce the milk amount if you reduce the eggs as you need a high enough quantity of eggs to set your quiche. 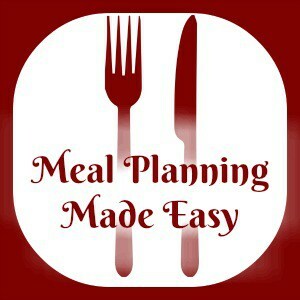 Pop in the oven until the quiche is completely set – this usually takes anywhere between 20 and 30 minutes depending on how much of your quiche is filling and how much is egg mix.